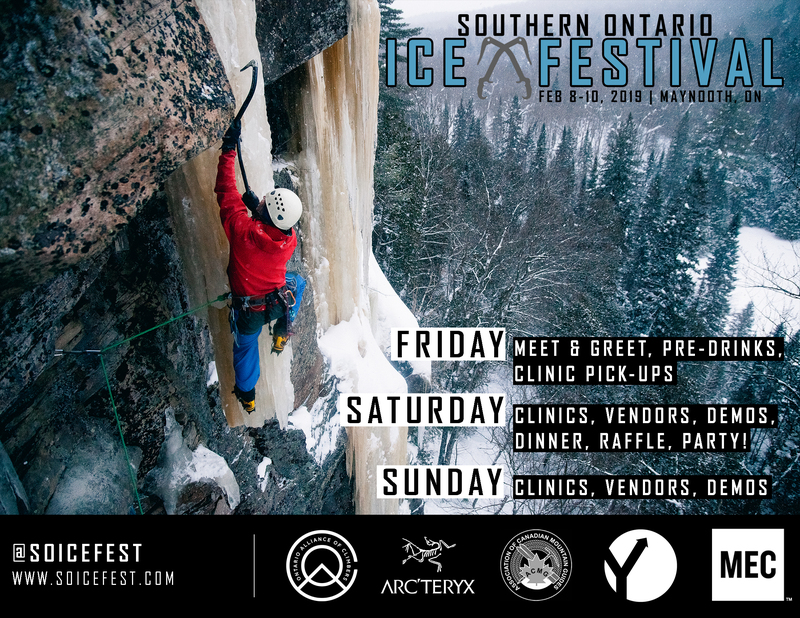 The OAC is pleased to be presenting the Southern Ontario Ice Climbing Festival! If you’re an avid ice climber or someone who’s never tried it before but think kicking crampons and swinging ice axes into frozen water could be your climbing destiny, then this fest’s for you! We’ve also got all the really good stuff like cool prizes, hot meals, and icy cold drinks in the small town of Maynooth, Ontario. Only a hop, skip, and a three hour jump from Toronto, you’ll definitely want to bring your friends because this is a weekend to remember (and carpool karaoke is better with a friend). More of the lone wolf ice climbing type? We’ll have tons of clinics and belay buddies ready for you. Mark your calendars for February 8 – 10, 2019 and keep an eye out for registration opening in a couple weeks. Clinic spots fill up fast, so you want to stay glued to @soicefest or the SOIce Facebook page for all the latest and be ready to pounce when the big announcement comes. The Ontario Access Coalition has been proudly serving the Ontario climbing community for the past 9 years. We have worked closely with landowners to ensure continuing access to beloved areas, advocated for proper crag etiquette amongst climbers, and promoted mentorship as the climbing population is booming. We’ve helped establish bouldering as a celebrated activity at the Niagara Glen, held yearly crag stewardship days, and purchased land to keep climbing open at Old Baldy. Our mission has always been to keep climbing and bouldering areas open. The issue of access is at the forefront of our existence, and has been squarely incorporated into our name. 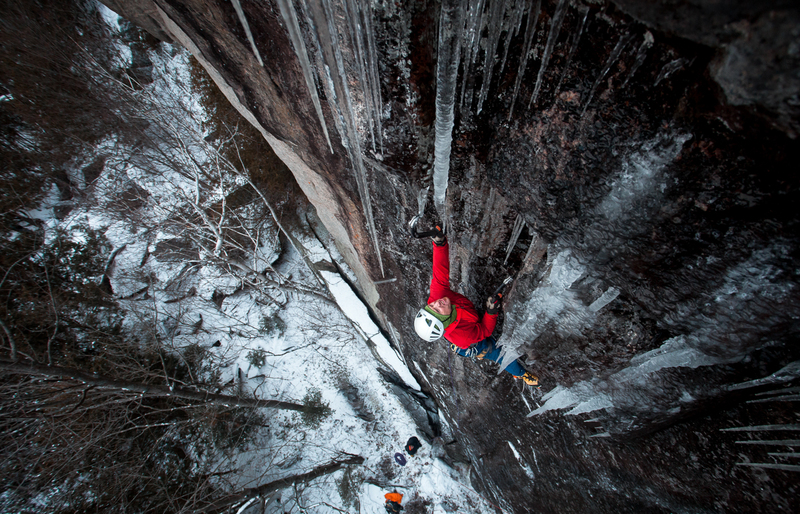 Today, we are eager to announce that we have a new name to go by: The Ontario Alliance of Climbers. Our goals are the same as always — we are an organization of climbers dedicated to keeping this sport alive and thriving in Ontario. Our name change does not signal a change in direction; rather, it prioritizes the fact that we are a climbing community, and that we strive to represent all climbers, of all disciplines, in Ontario. With this new name, our identity as a climbing-focused entity is solidified, and we are better recognized by landowners and other organizations we work with. Conveniently, you can still refer to us as the OAC. We have been working hard to serve the climbing community for years, and we are excited to continue doing so under our new name. You’ll notice that our social media accounts are already being updated, and you can find our new website at https://www.ontarioallianceofclimbers.ca/. Keep an eye out for new communications coming from the Ontario Alliance of Climbers in the future! We will be holding a Turtle Crag Information Session at Black Rock Coffee & Bar this Saturday, September 29th, at 6pm. 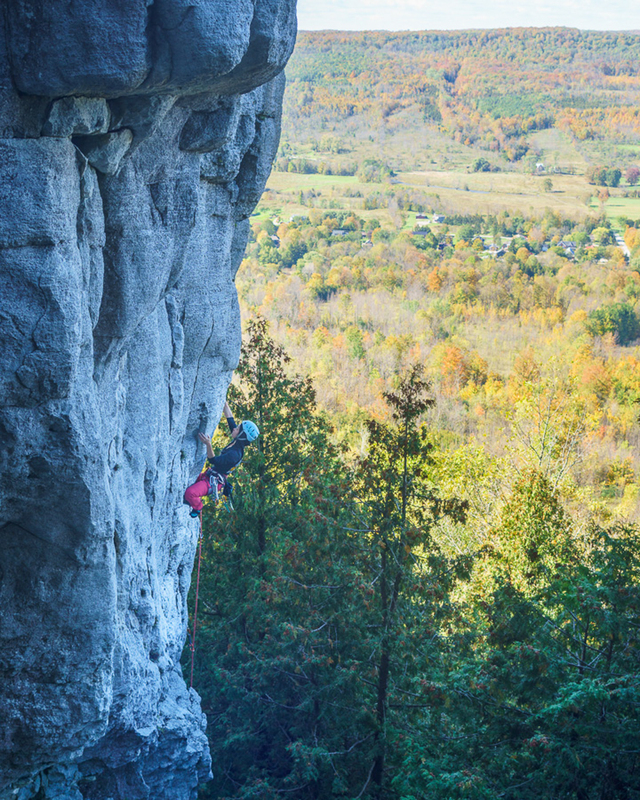 We’ll be discussing the recent land access issues which have come to light concerning Turtle Crag, what we’re doing to help, and how you as climbers can affect the future of climbing in Ontario. Patrick Lam will be leading the discussion, but come prepared with any questions you may have about climbing in Ontario and Turtle Crag in particular. NO Climbing at Turtle Crag until further notice. A representative of the OAC has met with the landowner, and we are working towards a solution together. We hope to have updates soon. Until then, it is vital that climbers avoid climbing at the Turtle to prevent further damaging relations. Submit your photos for the 2019 OAC Crags Calendar! Dear amateur and professional photographers, have you ever wanted to see your work published and hung on walls? 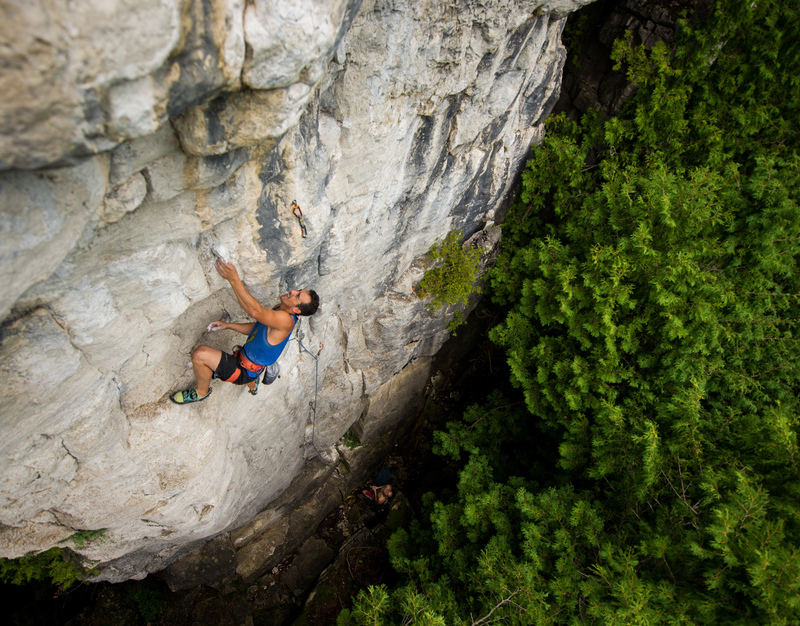 We are putting together our annual Ontario Crags calendar and we need your help! Please consider donating a photo to help raise awareness and funds in support of the Ontario Access Coalition. 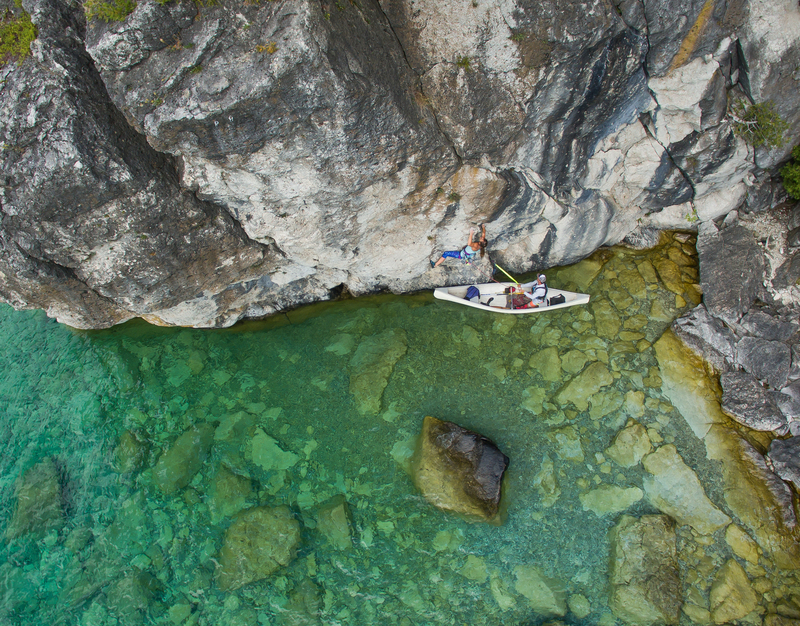 The Ontario Crags calendar aims to celebrate and highlight the wide variety of climbing that Ontario has to offer. We want to showcase everything from as many different crags and seasons as possible — ICE, SPORT, TRAD and BOULDERING are all honoured here. Valid photo submissions must have LANDSCAPE orientation (i.e. horizontal), and be of climbers at Ontario crags only (of course!). Please send your best shots to submissions@ontarioaccesscoalition.com by TUESDAY, OCTOBER 9th for a chance to have your photo featured and credited in the calendar! Chosen entrants will get a free copy of the 2019 calendar as well as a credit complete with your name and website. Please see additional rules of submission here. Thanks in advance for your efforts to support the OAC! The Ontario Access Coalition 2018 Annual General Meeting was held on June 28, 2018. Thanks to Joe Rockhead’s for hosting. We welcome new board member Mike Makischuk and returning board members Randy Kielbasiewicz and Patrick Lam, and look forward to a productive 2018-2019 year continuing to advocate for climbing access in Ontario! Register for the 2018 Beaver Valley Climbing Festival Now! The 2018 Beaver Valley Climbing Festival is THIS weekend! 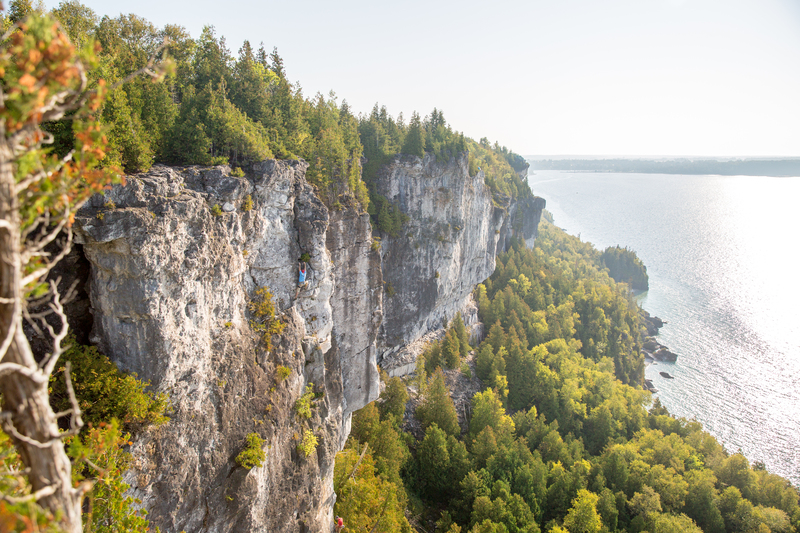 We’re excited to celebrate Ontario climbing with you in the year’s biggest party. We have a great line up of clinics, vendors, and raffle prizes in store — all capped off with a night of live entertainment from the lovely Ariana Gillis. What more could you ask for? Last year we came close to our 300 person max capacity, and we recommend registering now to secure your spot. Climbers from all over Ontario — and even outside the province — will be arriving to partake in the festivities. Your $44 registration fee covers camping, food, and live entertainment, plus all proceeds go directly toward maintaining open climbing access in Ontario. Help protect the lands you climb on WHILE enjoying them! Don’t hesitate, get your name on the list now — Sign ups after noon on Friday must be done on-site and the price will be raised to $45. See https://www.ontarioallianceofclimbers.ca/bvcf-2018/ for more details and to sign up. Beaver Valley Volunteer Coordinator Wanted! Are you interested in helping us run the Beaver Valley Climbing Festival? We’re in need of a volunteer coordinator who can help manage our efforts. If you’re great at directing, have good organizational skills, and are enthusiastic about climbing, we want to hear from you! Please contact info@ontarioaccesscoalition.com by June 9th if you’re interested in taking on this task — we’re looking for someone who is excited about seeing BVCF continue to be the number one climbing celebration Ontario has to offer. The OAC invites all members to partake in our 2018 Annual General Meeting on June 28, 2018. It’s a great opportunity to ask questions about the organization and our on-going projects, in addition to sharing your input on the future direction of the OAC. We’ll be holding the election for board membership, talking about the past year’s accomplishments, and discussing what’s on the horizon. The meeting will be held at Joe Rockhead’s Indoor Rock Climbing Gym (29 Fraser Ave, Toronto, ON) on Thursday June 28th at 7:00 PM. There will be a discounted climbing day pass ($10+hst) for all attendees! OAC membership is required for the discount. Come climb and stay for the evening! To be eligible to vote at the AGM, one is required to be a member of the Ontario Access Coalition. To allow for the processing of new members, please ensure applications are submitted prior to June 11th. Please visit our membership page at https://www.ontarioaccesscoalition.com/join/ for further details. The OAC is very interested in increasing its capacity by attracting new ideas, leadership, and energy. At this meeting, we will elect three members to the Board of Directors (for a two-year term each). As always, we are also looking for portfolio managers and general volunteers. While members can be nominated to the Board at the AGM, any nominations submitted by June 11th will have their profiles distributed to the membership in advance. This will facilitate a structured voting process. Interested members are encouraged to contact the OAC in advance. Calling all creatives! We’re looking to bring new energy to this year’s Beaver Valley Climbing Festival with an update to our festival logo. Do you have ideas for a new way to represent the BVCF and celebrate Ontario climbing? The winner will receive admission for TWO to the festival and a $250 MEC gift card — so that means you and your belayer can get in for free! Plus you’ll get recognition for redesigning a logo which will soon be recognized by the entire Ontario climbing community. PREFERRED: Vector eps file (such as an Adobe Illustrator eps) with all fonts converted to outlines. This file format is preferred because vector-based art can be resized without degrading shape or colour. Also acceptable: Raster image file (such as an Adobe Photoshop file). The logo must be a minimum of 2″ wide or 2″ high (whichever is the larger proportion) at 300 dpi. The image file may be delivered in any of the following formats: psd, tiff, png, or jpeg. Submissions will be accepted from now through July 8th 2018. Please send your entries to submissions@ontarioaccesscoalition.com with ‘BVCF Logo Contest Submission’ in the subject line. We’re looking forward to seeing what you’ve got! For the first time in the OAC’s history, and with the support of MEC, we are looking to hire someone to help us advocate for climbing access in Ontario. Our Fundraising & Outreach Coordinator will primarily develop sponsorship and business relationships with OAC stakeholders and participate in community outreach. The OAC has always been a volunteer-based organization, but as our role in the climbing community has grown and we’ve become more established, we have recognized the need to have a member dedicated to ensuring our continued success. The ideal candidate is proactive, organized, and detail-oriented with an entrepreneurial mindset. This is a contract position. For more information, see the job posting at https://www.ontarioallianceofclimbers.ca/climbers/careers/. For full consideration, apply by May 11. We look forward to working with the successful candidate! 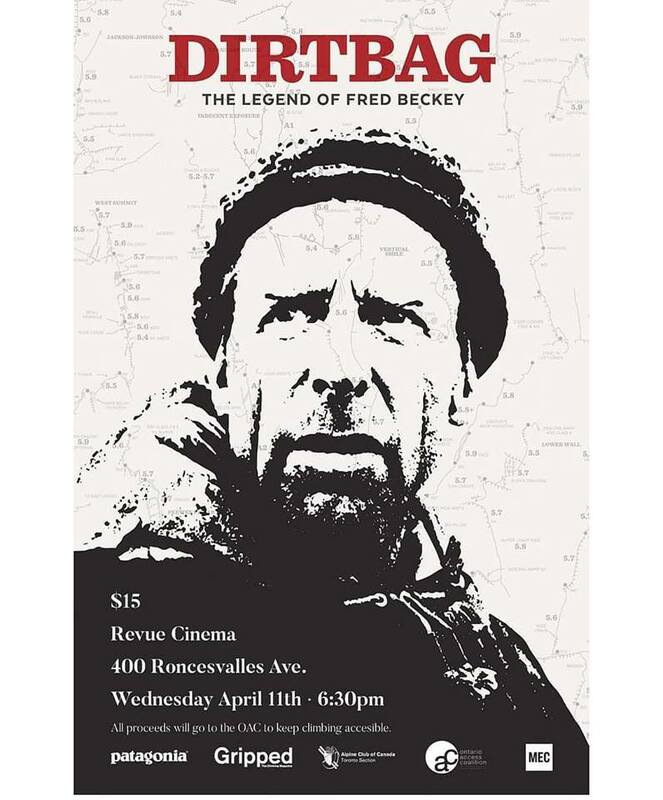 A sold-out crowd enjoyed our April 11 screening of Dirtbag: The Legend of Fred Beckey. Thanks to everyone for coming, Mike Makischuk for organizing the event, and our sponsors (MEC, Arc’teryx, Patagonia, Boulderz, Gripped Magazine, and DMM) for supporting the event. Together, we raised over $3000 to support Ontario climbing access. 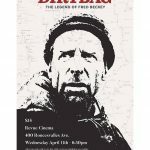 We hope to see you at similar events for future climbing films. Mark your calendars now: this year’s Beaver Valley Festival is going down July 20-22nd! Join us up at the Rob Roy Dogsled Farm again as we celebrate climbing in Ontario with the year’s biggest party, headlined once again by Ariana Gillis. Food, raffles, clinics, and an all around good time are to be had—in addition to some fantastic climbing of course! We’re also holding a contest to redesign the Beaver Valley Festival logo. The winner will receive free admission to the festival for TWO—so you can bring your belayer! The submission deadline will be May 21st. More details to come soon. 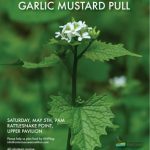 Help us preserve the environment and fight invasive species at one of Ontario’s most popular crags, Rattlesnake Point. 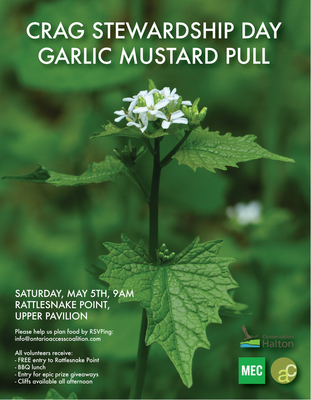 Join us at the OAC’s annual weed pull and garbage pickup, held in conjunction with Conservation Halton, this May 5th! This is an all-day event. Register here! And bring a friend or two, the more the merrier. We’re excited to see you! On April 19, 2018, the OAC met with the Halton Region Conservation Authority (Conservation Halton) to discuss mutually beneficial opportunities. We plan to share more details of this meeting soon. No New Routes may be developed at Mount Nemo Conservation Area. This includes both traditional and bolted sport climbs. No cleaning or removal of cliff face foliage will be tolerated under any circumstances. Please limit erosion at the base of the cliff by climbing in small parties and keeping as close to the cliff face as reasonable in talus-free areas. 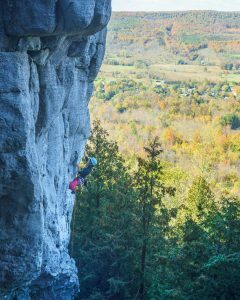 Climbing on Conservation Halton land is a privilege and not a right. By working with Conservation Halton and acting as stewards of these fantastic areas, we can maintain our climbing access to them. Seeking Halfway Log Dump site hosts for 2018! Are you an Ontario boulderer who enjoys getting on real rock? We need volunteers to act as site hosts at Halfway Log Dump this summer! As site host, you’ll act as a crag steward for climbers visiting the area, and be there to explain the joys of climbing to curious tourists. This role is vital to maintaining a strong, positive presence at HWLD, and ensures that we can keep sending there for years to come. Recently, climbers at Bow Lake have reported possible access issues. No Trespassing signs have been popping up around popular access points and at the base of the cliff. One group of climbers was also left an anonymous letter on the windshield of their parked car, informing them that they had parked in a spot they shouldn’t have. We’d like to remind everyone that parking should be done off of Hwy 28 on Lower Faraday Road. Parking is also permitted in the Faraday Township Fire Station parking lot, but be sure not to obstruct emergency vehicle access. The OAC is in the process of contacting the land owners and confirming public access to the crag. A public update will be made once we have clarified the situation. We exist to help iron out any wrinkles that arise between climbers and land owners. If you are ever approached by someone who objects to your presence at a crag, please respond politely and appropriately. Gather the name and contact information of the individuals in question, and assure them that the OAC will be in contact with them. We want to maintain strong, positive relationships with our land owners to ensure that climbing access remains open for everyone. If there are ever any questions about crag status, we will work with the suitable bodies to determine what the boundaries are. Please contact us first before posting to social media. This will allow us to build solid connections with the community and verify that the correct information gets passed around. Thank you, and happy climbing! This new website is the culmination of many months of work by our website team. We hope you will find it to be a useful resource. We intend it to be much easier to navigate and for it to contain useful information for our stakeholders—climbers, land managers, and the community in general. While upgrading to the new website, we seem to have inadvertently sent out notification emails about each of the changes that went into the website. We apologize for this unfortunate glitch. The OAC has been in contact with the Grey Sauble Conservation Authority (GSCA) regarding parking at Old Baldy Conservation Area. The GSCA has confirmed the status of parking at Old Baldy Conservation Area. The parking area itself is on GSCA land while the access trail is located on an easement (right of way) and does not trespass on private land. Maintain good relations with all landowners and direct them to the Grey Sauble Conservation Authority if asked any questions. On Sunday October 8th 2017, an individual was seriously injured in a climbing related incident at Devil’s Glen Provincial Park. The rescue response was led by local Emergency Medical Services, who arrived on the scene promptly. Several climbing parties guided the response team to the victim and helped clear debris, facilitating and improving evacuation conditions for the response team and the injured climber. Evacuations from most Ontario climbing areas, including Devil’s Glen, are always complicated endeavours. Climbers must recognize that evacuations are difficult and often lengthy. Therefore climbers must also recognize the importance of their personal and party safety and take appropriate precautions while climbing in Ontario. Helping our fellow climbers in time of need is a deeply ingrained part of our climbing culture. We ask all climbers to join us in wishing the best possible outcome for the injured climber. The Ontario Access Coalition extends a sincere thank you to all Emergency Medical Services and individuals who took part in the successful evacuation. As representatives of the Ontario climbing community, the Ontario Access Coalition looks forward to working with Emergency Response Services, land managers and local communities to facilitate continued improvement of evacuations and high angle rescue scenarios. Please send your best shots to Bonnie at bonniedb@hotmail.com by THURSDAY, OCTOBER 5th for a chance to have your photo featured and credited in the calendar! Chosen entrants will get a free copy of the 2018 calendar as well as a credit complete with your name and website.